To celebrate our love for Lunar New Year snacks—pineapple tarts in particular—we worked together with Creme Maison Bakery to produce four modern flavours of the well-loved snack. After numerous brainstorming sessions and R&D, the four flavours are born: French Rose, Nutella Swirl, Pandan Kaya and Chicken Floss. We wanted something new and refreshing, flavours that are close to our hearts and well-loved by Singaporeans, yet not steering too far away from its original taste and nothing too foreign that the old folks wouldn’t like. You can pick any two flavours. Encased in an elegant Tiffany-blue magnetic box that bears silver embossed geometric flowers, we kept it simple and classy so that they are befitting as gifts for your loved ones and prestigious clients. All our Pineapple Truffles are halal, so our Muslim friends can enjoy them too even if you do not celebrate Lunar New Year! 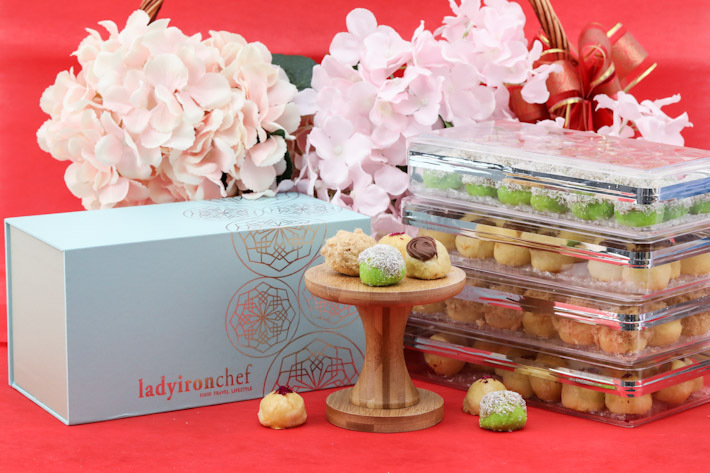 Only top quality ingredients are used, and they are all baked without preservatives so they are best consumed fresh and within the CNY period. For the love of rose and rose-flavoured anything, the addition of fresh French rose adds a subtle fragrance and sweetness to the Pineapple Truffles. It may sound like nothing but the truffles are evenly perfumed throughout and it is actually the most addictive among all. Who doesn’t love Nutella? The hazelnut spread is loved by many Singaporeans and we are keeping this one simple by baking a dollop of fresh Nutella and have it sit atop our Pineapple Truffles. The kids will love this! Think of ondeh ondeh, the popular nyonya kueh. We’ve incorporated lots of pandan and dessiccated coconut into our Pandan Kaya Pineapple Truffles. We are careful about keeping the flavours balanced without overpowering the pineapple jam, and after three revisions, the final product is an explosion of flavours in every bite. With a parmesan cheese exterior and lavishly topped with chicken floss, this savoury Pineapple Truffle pays homage to Singapore. The crust is only very slightly salty because of the parmesan but the chicken floss complements the sweet pineapple jam so well that we’d like to think this is the MVP of the lot. The Pineapple Truffles are priced at S$58 for 2 flavours and they come packed together in one blue box. You can mix and match any two flavours of your choice. we are offering a 15% discount for early birds—valid from now until 22 Jan 2019. Corporate orders are welcome too! Self-collection can be done any time after 23 Jan 2019 at Creme Maison Bakery or via lalamove bike delivery at a top-up fee of S$18. Payment methods are via PayNow or PayLah!, iBanking or ATM transfer—to be further advised in the invoice.